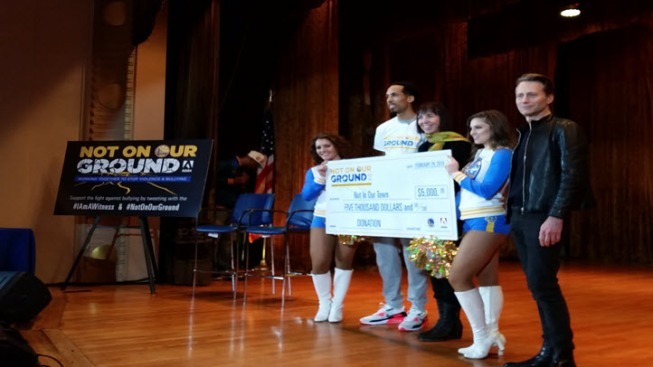 Golden State Warriors point guard Shaun Livingston joined anti-bullying advocates and San Francisco District Attorney George Gascon to bring a message about the harms of bullying and bigotry to hundreds of high school students in Oakland Monday afternoon. Livingston participated in a panel at the Scottish Rite Center on the shore of Lake Merritt and led the 300 gathered students from five area high schools in a pledge to reject hate, bigotry and bullying. "I pledge to stand up to all forms of hate, bigotry and bullying," Livingston said, reciting the pledge. "I will not stay silent in the face of intolerance based on race, ethnicity, sexuality, gender, religion, ability or any other factor." He the presented a $5,000 donation from the Warriors to Patrice O'Neal to help fund her anti-bullying advocacy group "Not In Our Town." The Warriors combined the name of that group with their own "Warriors Ground" slogan, dubbing their anti-bullying campaign, "Not On Our Ground." As part of the campaign, the Warriors created a public service announcement video that they screened for the students today. But little of what Steph Curry, Klay Thompson, Draymond Green and Andrew Bogut said during the video could be heard over the teens screaming at the sight of their favorite Warriors stars. During the panel, Livingston said he encountered some bullying growing up and said it can make finding your own unique identity even more difficult. "I think that's the hardest part about growing up," he said. Anti-bullying advocate Joseph Marshall, who used to work as a teacher and administrator, encouraged students to come forward if they see another student being bullied. He said students who see a fight at school or who notice harassment might be tempted to think it's not their businesses. "It is your business. It's everybody's business," Marshall said. "I don't believe in 'thou shalt not snitch.' I'm telling all the time." O'Neal called this not being a bystander, but an "upstander." She said intervention can be simple, like simply saying to a bully, "that's not cool." Livingston recounted that in his third year of the NBA his knee was severely injured. Doctors told him it might need to be amputated and he might never play basketball again, requiring tremendous perseverance to be able to rehabilitate himself and return to the league. "I had to build that confidence in myself to get over different obstacles in my life," he said, advising the kids in the room to stay confident in the face of adversity. Marshall said the kids need to "dare to be different" and make sure they reject bullying any time and place they see it and to pick their friends carefully. "A friend is someone who never leads you to danger," Marshall said, pointing out that just being around a bully could get someone into trouble, not just a school suspension, but potentially criminal penalties. "George knows," he said, gesturing to the district attorney sitting across the stage. "You all can be part of making that solution and we can't wait to see what you do next," O'Neal said to the students. Selected students from each school then participated in a contest for who could give the best creative presentation against bullying judged by Livingston, Gascon and the rest of the panel. Students from Berkeley High School likened bullying to police brutality in a short skit, while students from the Galileo Academy of Science and Technology in San Francisco and Fremont High School in Oakland students had video projects. Students from McClymonds High School in West Oakland along with the winning student from Skyline High School both had spoken word poems. The winning Skyline student, who took home a $1,500 prize, closed her poem to loud cheers, reiterating the Warriors theme of the day. Bullying wouldn't be accepted, she said, "Not in our school, not in our town and most definitely not on our ground."